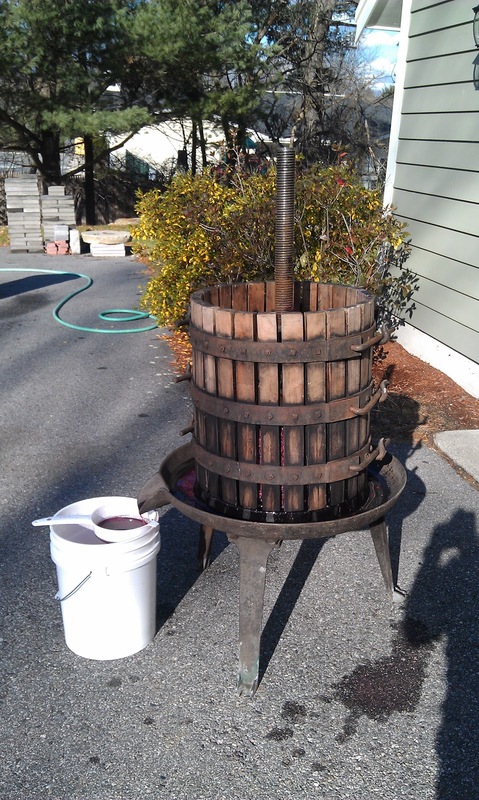 I haven't posted too much info on the 2011 wines after getting everything fermented, pressed, and into the basement for the winter since getting the winery applications submitted have been a priority. But since I'm a little in between things at the moment, and spending a quiet Sunday afternoon around the house while recovering from a long run this morning, I thought I'd reflect a little on the results. In particular, the grenache is not turning out as I was hoping. Recall, dear readers, that all of the 2011 vintage grapes arrived as crushed & frozen must (due to an unholy combination of cool & wet weather in CA, a record early snowstorm in New England, & my work/vacation schedule). Usually that means that you don't have to work very hard to extract color from the grapeskins because the freezing process does the hard work for you. Even with that going for me, I opted to apply the usual combination of pre-ferment tannin addition (30 g/hL FT Rouge dosage) and a 1 g/gal dose of Opti-Red to really go for a dark, bold color in the resulting wine. This combination strategy has worked incredibly well on previous vintages. Since the grapes arrived in crushed form, I don't have the supplier information. 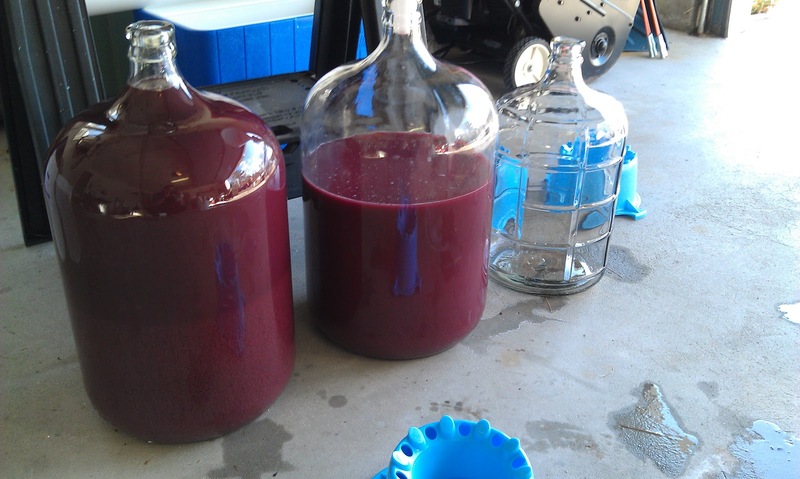 During fermentation, the color was definitely not as dark as my other varietals. After fermentation, well the pictures speak for themselves. After all the snow & turmoil before the grapes arrived, it turned out to be a gorgeous day for the pressing. You'll notice my pre-filter technique to catch wayward skins, seeds, or large gunk before it got into the buckets. That worked well, just the sieve caught a lot of material and had to be switched with a clean filter about every 10 minutes. 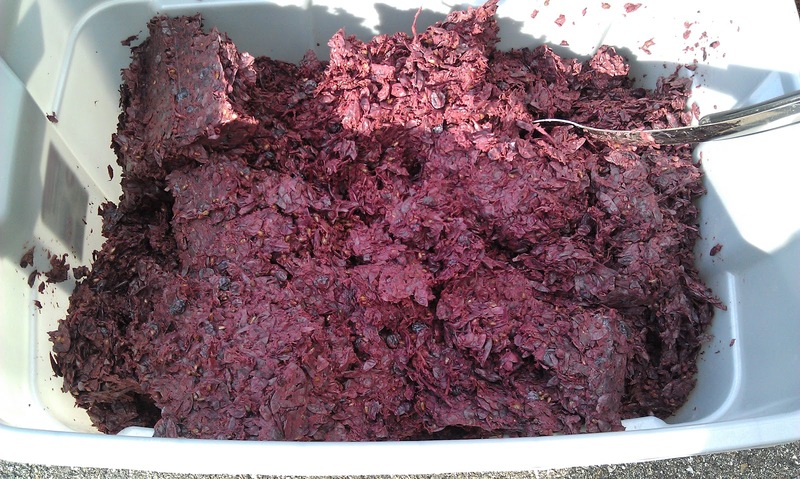 You can see that the pressed pomace is a very light color, which would indicate that I sucked as much color as possible out of the grapes. However, the pressed wine in the carboys is a pretty light color. Not much I could do at that point, and I thought that it might be reflective of the solids still present in the wine, so I let everything settle before racking off the gross lees. After malolactic fermentation in my warm spare bathroom, the carboys were transferred to the basement where they've sat until about 3 weeks ago when I freed up some barrel space so I could get this into a French Oak barrel. That racking really reinforced the color issue. Big tannin punch to the wine, but the color is slightly darker than a very dark rose. Aroma is wonderful--strawberries and plums. It's just that light color. Now--grenache is known to be a thin-skinned, light color variety, which is why it's the work horse grape for róse production in the Rhone region of France. And why's it's usually used as a blender in regions like the Rhone, or Priorat in Spain to make full-bodied reds. My ultimate goal for this wine is to blend it with syrah to make a Rhone-inspired blend. Also have some carignan so I can even try to emulate a Priorat blend. 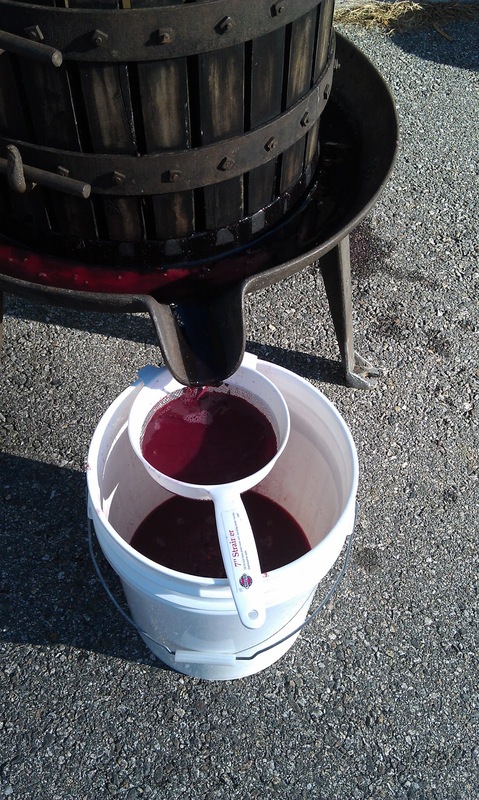 But the color of those blends is going to come mostly from the syrah or carignan. In the end, we'll see how it turns out--I was just hoping for a little more color in the grenache base wine. Perhaps if I have enough left over from blending, I'll even try to treat the single varietal like a Italian nebbiolo where is packed with tannins, but light in color. That is the beauty of wine--blend it to achieve what you are truly aiming for! Completely agree Joe! In fact, my original plan was to pull off some juice to make a rose. The freak snow storm in October resulted in having to crush & freeze the grapes so I opted to not do a saignee. In retrospect, probably could have still done so to get a darker rose wine. At this point, the tannins are too big for a rose so blending is the option.